When adding electric mods to your CB Accord one can fill up the accessory plugs on the under dash fuse box pretty quick. Adding wires can also get messy the more mods you’re adding. If you’ve read my MRT, chances are you’ll understand what I mean. Adding DRLs, automatic headlights, making your own fog light harness, power & heated seats etc. all can be done using the correct and often readily open ports on both fuse boxes. This will save you from filling up the (4 only) accessory ports after just a couple mods. 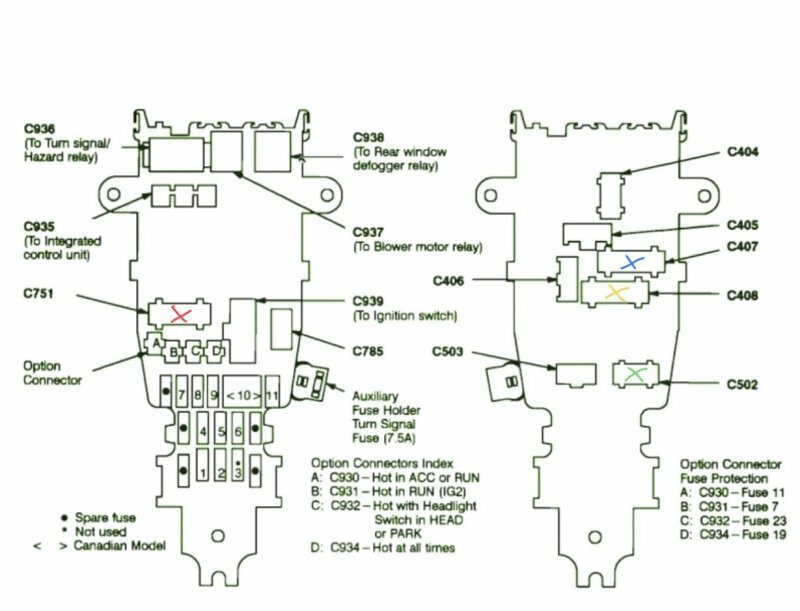 The image below shows the ports, plus more good information to know about your CB under dash fuse box. All the other plugs are not useable as far as adding to them. Pin#15 - power from defog relay. I think this can be used for heated mirrors. I’ll be doing some testing to prove that soon. Pin#3 - power from fuse 10. Fuse 10 is an unused fuse and is for (daylights) or DRL’s. Pin#9 - distributor power signal/ tach. Pin#12 - is open but has no pin and is not useable. Pin#6 - is open but has no pin and is not useable. Pin#7 - power from cruise control fuse. Pin#8 - is open but has no pin and is not useable. Pin#13 - is open but has no pin and is not useable. Pin#14 - is open but has no pin and is not useable. Pin#4 - is open but has no pin and is not useable. Pin#9 - is open but has no pin and is not useable. Ok now to elaborate on this information. 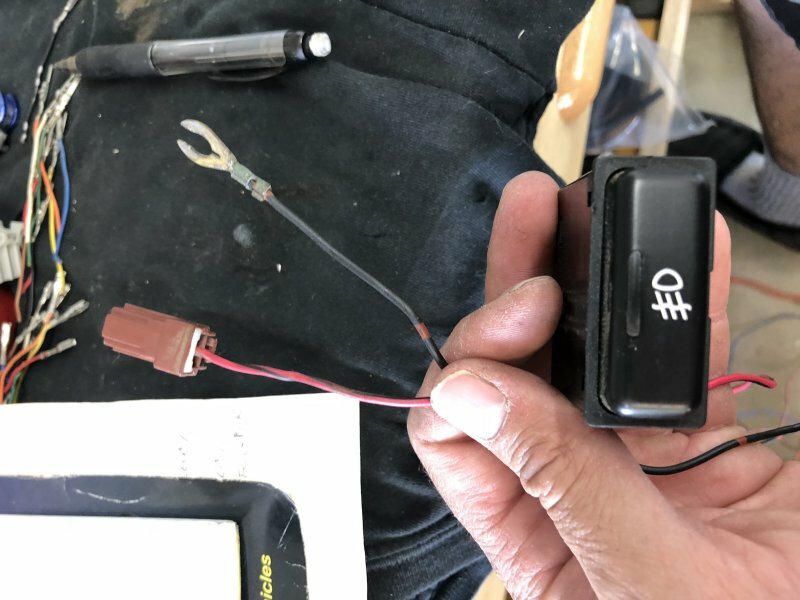 For those that have a manual transmission, weather it came with it factory or you have swapped to one there is a couple helpful lighting wires. 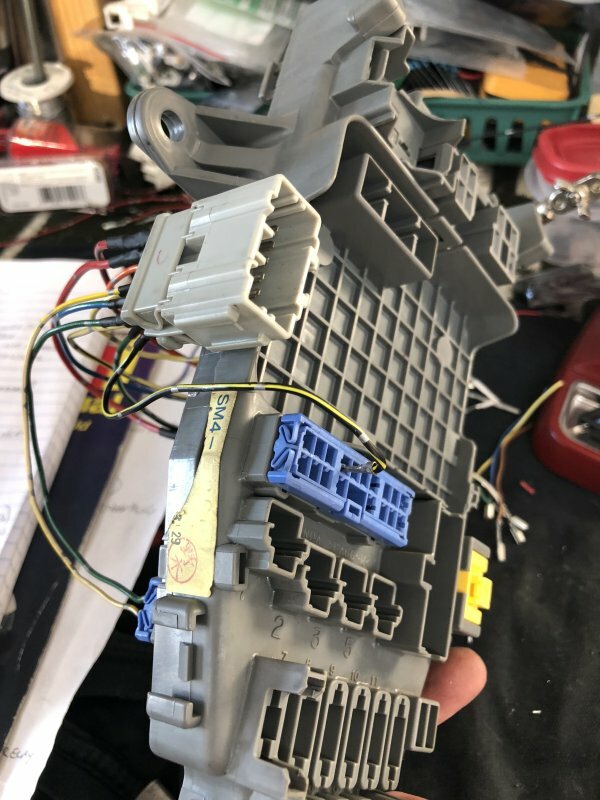 The two wire pin ports on the u/d fuse box that ran to the auto shift illumination can be used for button lighting when building a new accessory harness for say fogs, heated seats, etc. Pin 1 (red/blk) this is where you will connect your lighting power wire to. Typically on a Honda it’s red/blk. Pin 16 (red) this is for dimming. 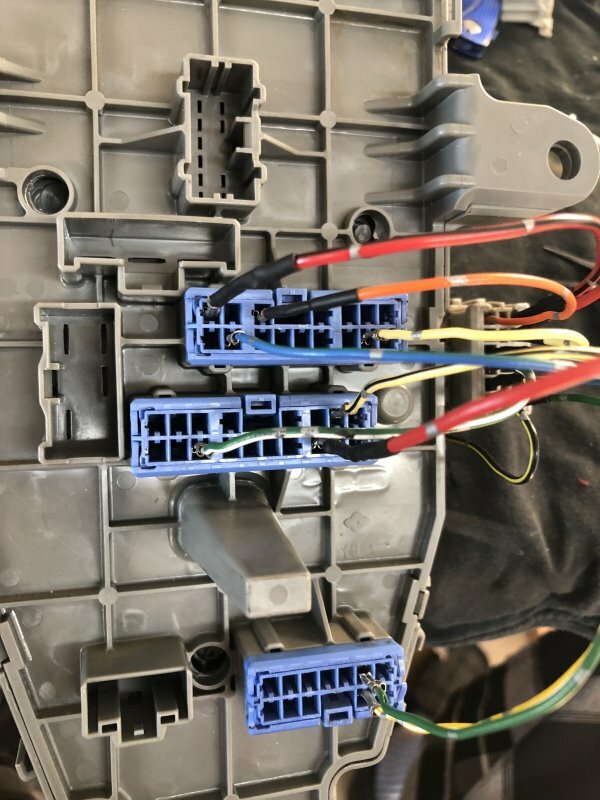 If you have ever deconstructed one of the optional fog light harnesses for the CB Accords you will notice there is a red/blk wire leading to a single wire plug that is supposed to plug into the parking lights accessory port on the u/d fuse box. The black wire goes to ground. This does not allow the button to be dimmed like the rest of the interior buttons. Here are the connections below. You can use these two pin ports to get the lighting wired correctly. Ive built a small harness and plug to test and utilize all of the extra useable pins on the four plugs listed in my first post. It’s way easier to take advantage of these pin ports with an easily accessible side plug. There is a plug lock on the left side of the u/d fuse box that is perfect to mount my 10 pin plug to. Here is an example fuse box on its side showing all of the ports that can be used. The goodies I have in my car use 8 of the 10 ports but I ran all 10 wires to the side plug for potential future use. Here is the plug done and the one wire that runs to pin 15 on C751. 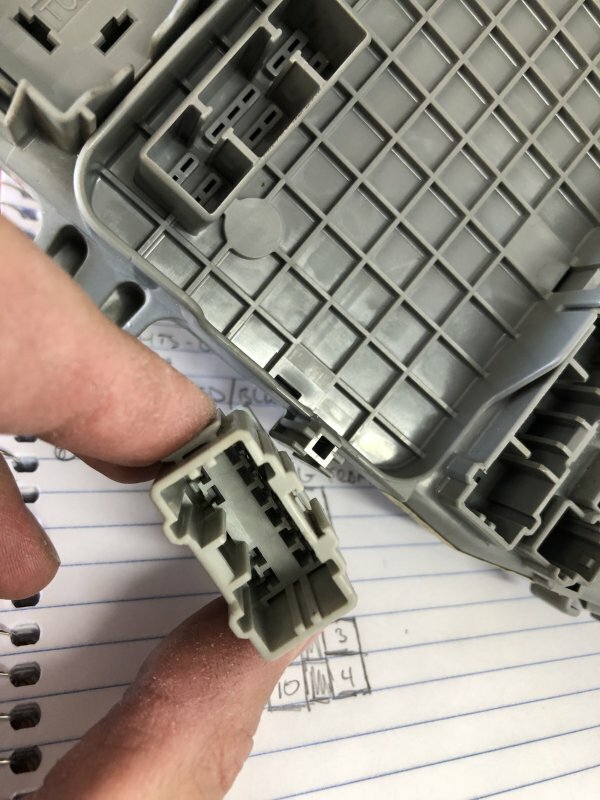 This plug is the 18 pin plug on the front of the u/d fuse box. Pin 15 should work for heated mirror option. More testing on that soon. So with this done you can mount your u/d fuse box back in its place and not have to unbolt it to access these valuable ports. You can now use them to your needs by adding your wiring to the male side of the plug. Happy wiring! Thanks for this, reminded me today of another 12V ign. source. Will use it for a volt meter gauge i'm installing into the center dash area. John, if you’re looking for a 10 pin male/female plug like I’m using, you can find one under the drivers side dash of 92-95 Acura legends. The 10 pin male/female plug has been kind of a hard plug to find so far. But the legends have one. In other research I’ve been studying the directional pin #7 on plug C502 and what its purpose would even be. It is tied into the combo switch end of the wiring. Running to the controller box on the fuse box. From there I think it goes to the relay. So if it’s before the relay maybe the pin just powers on when the R & L turn directions on the combo switch are made. This would be very interesting as the optional cornering lights would need a power source pretty much like this pin. It’s purely hypothetical right now. I’m going to hook this plug up tomorrow in my car and see what the actual testing results tell me. More to come! Last edited by NH-503P-3; 09-22-2018 at 12:16 AM. Yep, and connections A, B, C, D are power sources. It's funny that these are not mentioned in the manual though.